We are happy to announce a new Trackops mobile app, designed specifically for field investigators, is now available! Currently, the app is only available for iOS (e.g. iPhone & iPad), however an Android version is in development and will be released in the near future. Update 06/16/2016: Trackops for Android is now available for download on the Google Play Store. 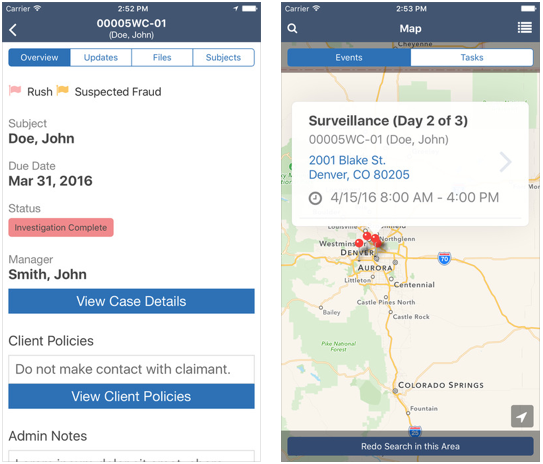 With the mobile app, investigators can find recent cases, post updates and files, see their schedule, and complete tasks. In addition, mobile users can now take advantage of Mobile Event Check-Ins, a new feature that allows investigators to notify the system when they have arrived at a scheduled task or event. Mobile check-ins capture investigators’ timestamped geo-coordinates, and logs them on their respective tasks and events. This new capability increases transparency, and allows you to confidently provide case results to your clients. Download the Trackops Mobile App for iOS (or search for Trackops on the App store). Download the Trackops Mobile App for Android (or search for Trackops on the Google Play Store).